Washington, D.C.— Street artists from coast to coast are using the power of art to draw attention to the ongoing destruction of Indonesia’s rainforests. Images of Birds of Paradise, one of the most iconic species of the Island of New Guinea, are now part of the urban landscape in New York City, Long Beach, and Oakland. The Wings of Paradise Project is organized by Greenpeace as part of a worldwide effort to shine a light on the importance of these forests–the third largest on the planet–in the fight against climate change. 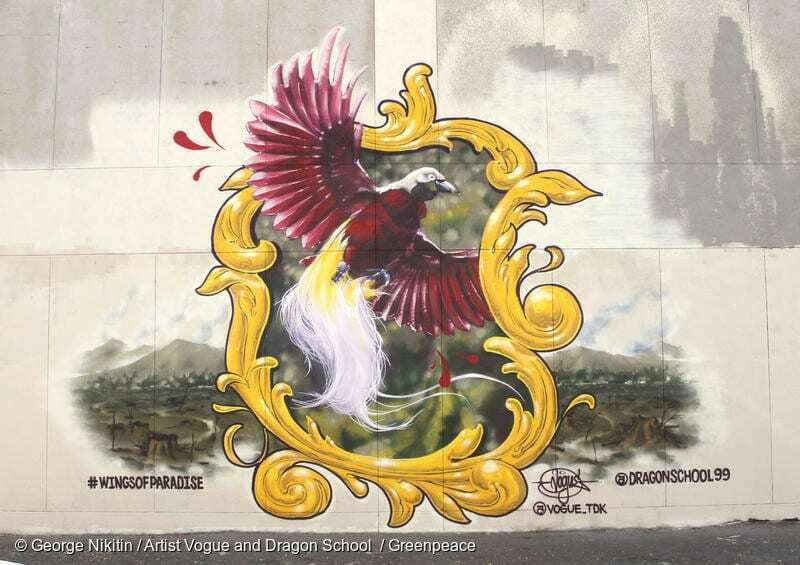 Bold, colorful images of the Birds of Paradise have appeared in Oakland, California’s Chinatown; in Long Beach California’s Cambodia Town; and in New York City’s Lower East Side. This worldwide art intervention involved 19 artists and is taking place in 20 cities around the globe including London, Jakarta, Taipei, Paris, Vienna, and Istanbul. “The palm oil industry has already trashed large areas of rainforests in Indonesia and it’s now creeping into the pristine landscapes of Papua to expand its operations. 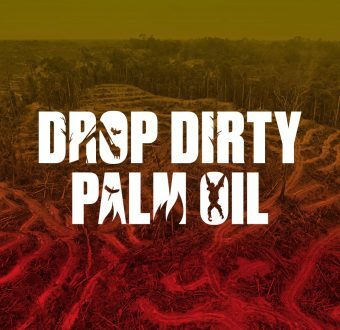 We have a big chance to come together to stop a devastating loss before it happens and to demand that companies like Nestlé, Colgate-Palmolive, and Procter & Gamble drop dirty palm oil. While these brands are bringing deforestation into our homes, artists across the U.S. are sending an urgent warning about rainforest destruction,” said Diana Ruiz, Greenpeace USA Senior Forest Campaigner. For centuries, the forests of Papua and Papua New Guinea have been protected by thick forest cover. But as the palm oil industry expands its operations, this fragile ecosystem is endangered, risking the homes of unique species like the Birds of Paradise. There are 41 known species of The Birds of Paradise and 37 of them are in New Guinea. Papua holds around a third of Indonesia’s remaining rainforest, but those forests are increasingly under threat from the palm oil industry. Tree cover loss in Papua has steadily increased over the last five years, more than tripling between 2011 and 2016. Palm oil is found in more than half of all supermarket products, but in order to make those products, many palm oil suppliers are destroying rainforests. Palm oil can be produced without contributing to deforestation. Household brands like Unilever, Nestle, Colgate-Palmolive, and Mondelez have promised to only buy palm oil from companies that are not destroying rainforests or exploiting communities, but our researchers recently discovered that they’re breaking this promise. New York City [Allen Street and Stanton (Houston)]: Jess X. Snow is a queer asian-canadian filmmaker, public artist and pushcart-nominated poet. She holds a BFA from the Rhode Island School of Design and is currently studying directing in the MFA program for film at the NYU Tisch School of The Arts. As a result of the rootlessness and migrations that marked her childhood, she developed a stutter which she overcame through her discovery of visual and written language. Oakland (Chinatown 8th Street & Broadway): Norman “Vogue” Chuck is an American graffiti artist, calligraphist, illustrator and graphic designer best known for his photorealistic “Spraycan Art” and Murals. Born and raised in the San Francisco Bay Area, Norman’s unique style and work ethic was shaped by his studies at The Academy of Art (San Francisco), his family, friends (TDK!) and his passion for street art. The creative forces behind Norman’s work are clean designs, sharp calligraphy, street life and hip hop. Having had gallery shows in San Francisco, Norman is now currently focusing and expanding his portfolio with more intense visuals based on the spray can on canvas medium along with some mural work. Long Beach (E New York Street & Lewis): Ricky Lee Gordon is a self-taught artist born in Johannesburg South Africa in 1984. Having lived and worked in Cape Town he moved to LA in 2016 to study classical painting. He is well known for his large-scale murals that can be seen in cities all over the world, from New York to Istanbul and Madagascar to Kathmandu. Ricky has been inspired by his experiences in meditation and Buddhist Dharma (law of nature) and therefore now his paintings explore the nature of non-duality and interconnectedness focusing on bringing to light relevant social issues and universal truths. His intention with his murals is to create artwork that has a connection to the people and place in which he is painting. Kate Fried is a Senior Communications Specialist for Greenpeace USA. With nearly two decades of communications experience on behalf of progressive organizations, her work at Greenpeace focuses on deforestation and climate issues. She is based in Washington, D.C.